A fire has broken out in Mamman Kontagora House in Marina, Lagos State.The building is located near the Nigerian Ports Authority, NPA, in the CMS area. The Lagos State Fire Service was spotted trying to curtail the fire outbreak. The building houses many businesses and currently the exact extent of the damage caused by the fire is yet to be ascertained. It has however been confirmed that the fire which began at about 9am this morning, emanated from the Third Floor of the Federal Mortgage Bank located in the high rise building. An eye witness account says that the fire was caused by a generator on the 3rd floor of the complex and later spread to the 5th floor where the banking hall is located. 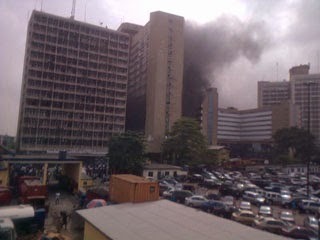 By 12.30pm, the fire had extended to the eighth floor of the complex and has affected a law firm and NDIC (Nigerian Deposit Insurance Corporation) also located within the complex. However reports have indicated that no casualty has been recorded despite the inferno lasting for several hours, members of the fire service corp have been battling the fire outbreak for hours now.